Architectural columns can be turned, or existing ones matched. Fluting, reeding and twisting can also be carried out. These can be made in a style of your choosing, to a drawing, photo (with measurements) or C.A.D drawing. Patterns can be made from drawings to be used as moulds for casting if required. It was made in european oak. The base and the Capital are made from the solid. Columns of this type can be turned with a shaft length of 2400mm Long and up to - 280mm diameter depending on the design and construction method used. 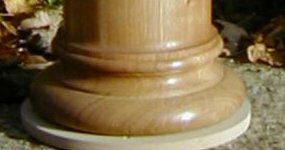 The base and capitals are turned separately for mounting the shaft onto. Left: Restoration of Old existing column, which new bases were turned for. 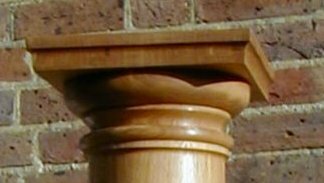 Column bases and capitals can be turned up to 2' diameter (610mm) They can be turned to match existing as replacements, or to a style of your choosing. Larger sizes can be catered for depending on construction methods used. 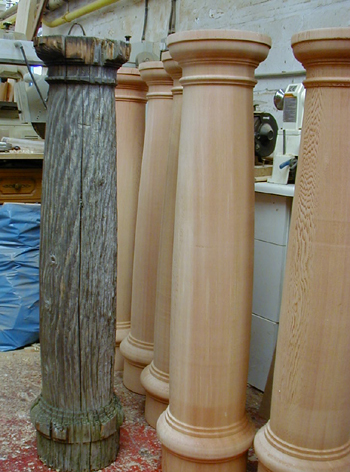 Right: Cedar columns made as replacements for the damaged originals. Existing posts can be copied if required. 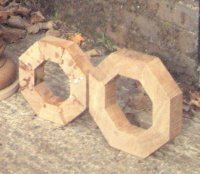 Porch posts can be made in one piece up to 2400mm in length and 100mm -250mm square They can be made in longer lengths, and larger diameters depending on design and construction methods used. Dave and a large Iroko porch post one of a pair.